These speakers look and sound great, but do some physical imperfections make this a pass, or are they still worth it? Decent build quality and great sound quality for the price. Heavier than they should be with a few physical imperfections. So long as you don't plan on carrying these speakers around with you, they are a great value with a good look. The understated design of the speakers is very pleasant. Light curves with a semi-matte finish makes the speakers look like they belong on a computer desk. The silver and gold accents matched with the honeycomb design under the woofer make the speakers stand out in a way that is not obnoxious, but instead adds a nice amount of color to a computer setup that would usually be all black. 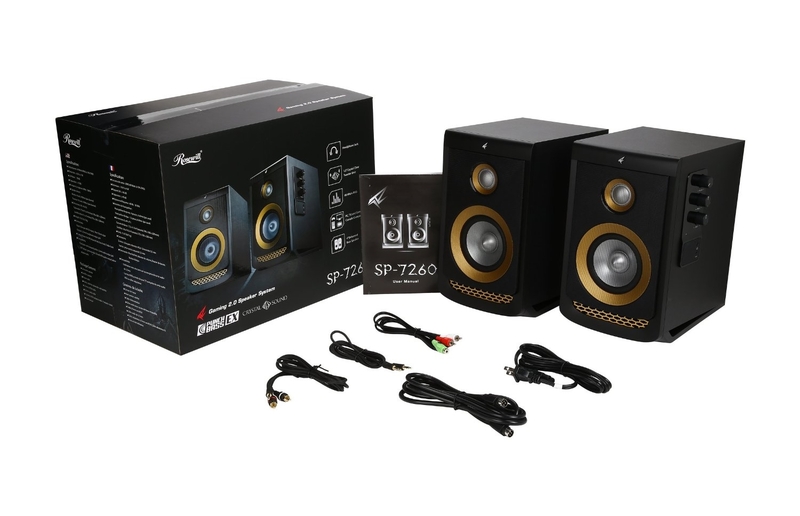 The sound quality of these speakers is pretty great for what they are and at their price point. However, since they are simply a pair of tweeters and woofers, but are lacking a dedicated subwoofer, the producible range is not ideal. Super-low sounds are muffled because they are trying to be simulated via a standard woofer instead of being produced by the appropriate but missing subwoofer. For some types of games and video content this will be just fine, for example comedy movies or casual games. In using them for action games or movies, however, you will definitely notice the lack of sound range. These speakers have all of the connections you would expect, and one you might not. Being computer speakers, connecting them via a standard 1/8" inch connection is not only easy, but included. Using the cable in the box, I connected the speakers from the green jack on my computer to the dual RCA jacks on the back of the main speaker, which is a connector I wasn't expecting. Because of the RCA jacks, you could connect a non-amplified source as well, such as a turntable. In addition, I have my phone connected to an aux jack on the side of the main speaker so I can play Groove Music without running the app on the computer. There is also a headphone jack on the side, so you can go from public sound on the speakers to private sound on a pair of headphones. The quality of the speakers is better than average. The body is made of a thick material, even the front mesh holds in place well when put under normal amounts of pressure. Unfortunately, the seams are not all even. There are some gaps that shouldn't be there and corners that should be level that are not. If you intend to put the speakers on a desk, which is the most likely intention for them, then these minor issues should not affect their behavior. If these speakers are intended to travel, however, the gaps could become worse under pressure. For their sound quality and volume capability, the size of the speakers is about right. They might be a little big for some computer desks, but for most they would fit and look good. As for weight, they are far heavier than one might expect for their size. In out studio, we have a pair of studio monitors just a bit larger than the Rosewills, but are far lighter, even though they are a far higher quality speaker. Of course, the weight of the speakers is really only important if they are being shipped or carried somewhere.